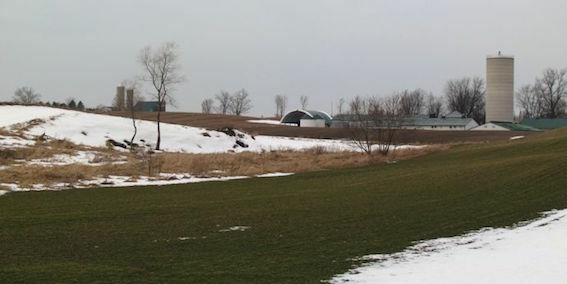 AUBURN – My hubby and I love hiking on the many lovely nature trails that Huron County has to offer. 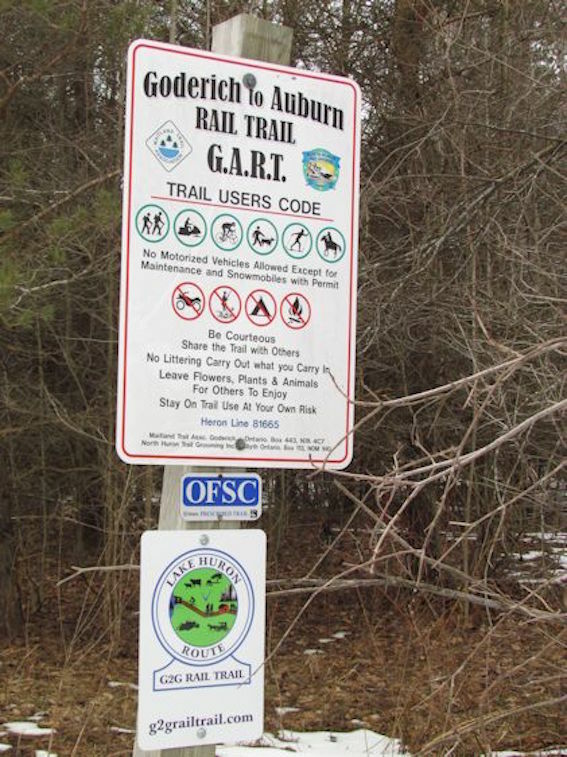 The spring-like weather recently was the perfect time to check out the section of the GART (Goderich to Auburn Rail Trail) that we are taking responsibility for this year as Trail Rangers for the Maitland Trail Association. 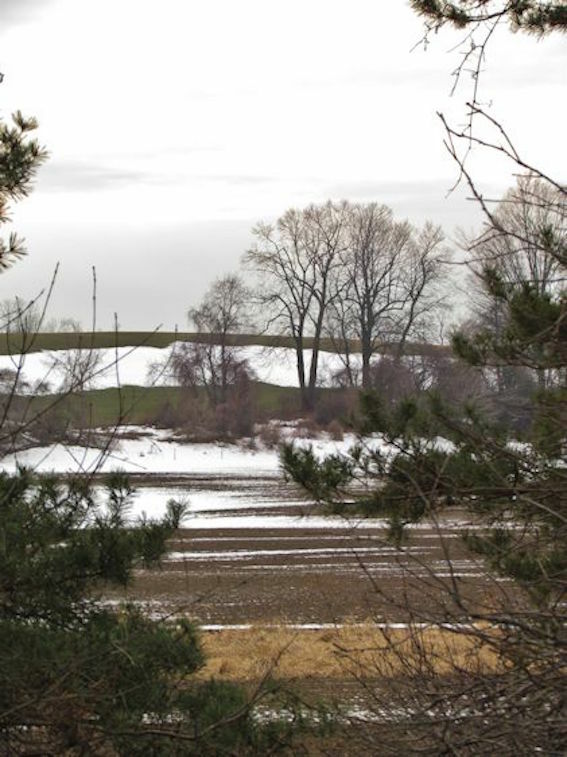 The GART follows the old CPR rail line from the historic CPR Station in Goderich (now the Beach Street Station restaurant) to the remnants of the former bridge over the Maitland River just west of the village of Auburn. The trail is a little over 13 km long with the vast majority of it being an easy walk over flat ground on a fairly wide and well cleared trail. For the most part, the trail base is made up of finely crushed rock with flat grassland and hard-packed soil in other sections. Large sections, especially at the beginning of the trail, are wheelchair and stroller accessible (not in Winter). The entire trail is great for riding bikes (not in Winter). 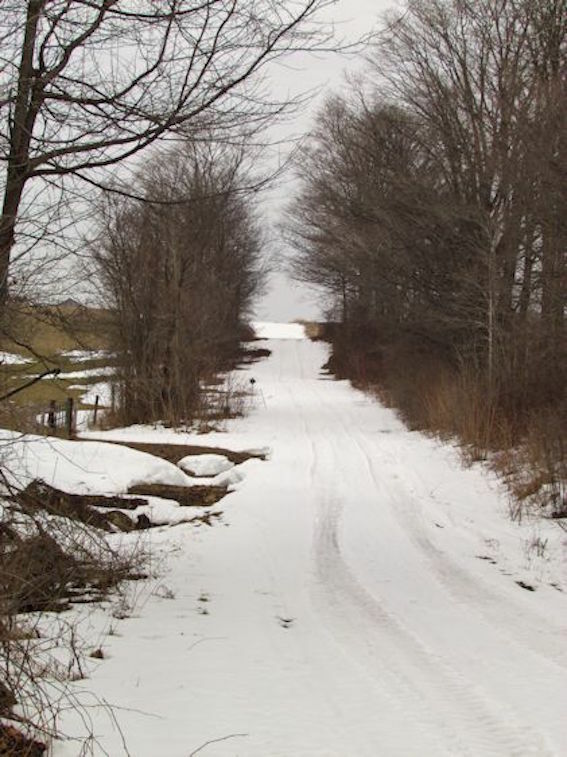 Part of the GART is also used as a snowmobile trail in winter. This weekend we hiked the section between Sharpes Creek Line and Heron Line, a distance of approximately 4 km return. 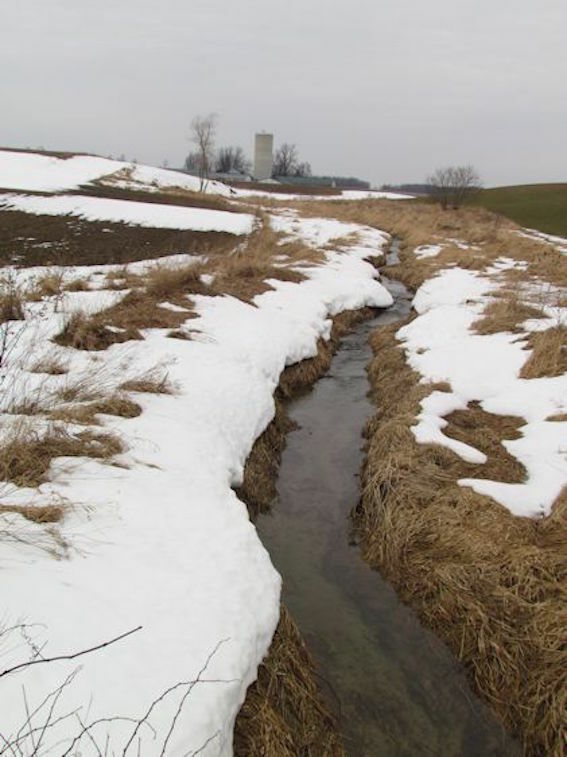 Depending on the season, there is a little space for parking one or two cars on either side of the road edge on Sharpes Creek Line. The trail entrance is well marked. As we walked along we enjoyed the wind whispering through the tops of the Scots pine that line each side of the trail. The pines give way to scenes of rolling farm fields and tree studded hilltops. Towards the far end, there is a small bridge that spans a burbling stream. The trail is popular with walkers, joggers and their faithful four-legged companions. It is also a veritable highway for the local wildlife. 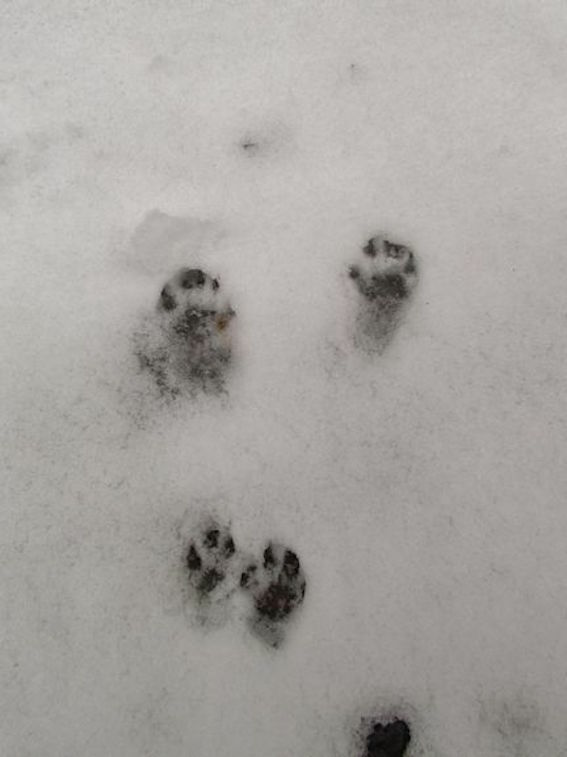 A thin layer of snow made the perfect medium for leaving tracks of all shapes and sizes. We saw squirrel, rabbit, hare, and fox tracks along with the snake-like trail of a field mouse in the snow. We also got to enjoy the sound of chickadees “chick-chick-chicking” us and the sight of a beautiful hawk soaring in the sky. 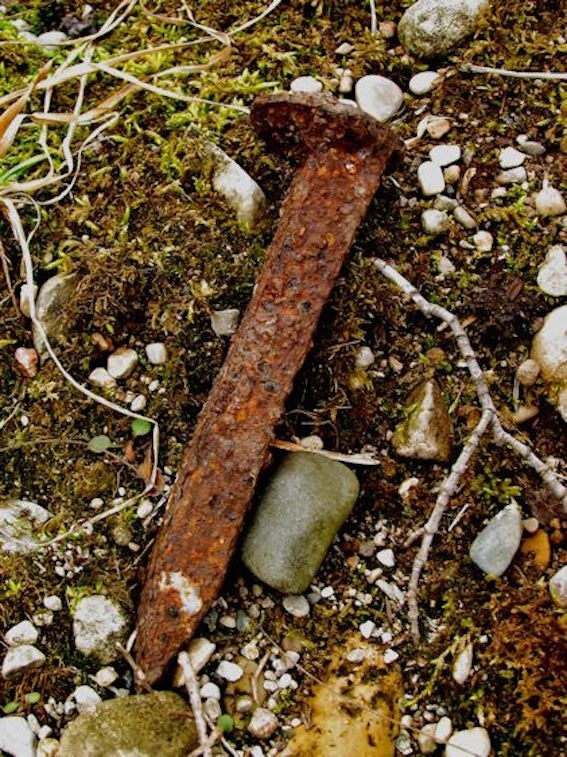 I even found an old rusty rail spike lying on a mound beside the trail giving evidence of the trail’s former glory as an active rail line. If you are looking for an easy stroll filled with peace, tranquility and pleasing scenery, give a section of the GART a try. There are eight or nine different access points for the trail so you can walk just one section at a time if you wish. My only complaint/comment about the trail is that there aren’t any benches to sit on for most of the trail.